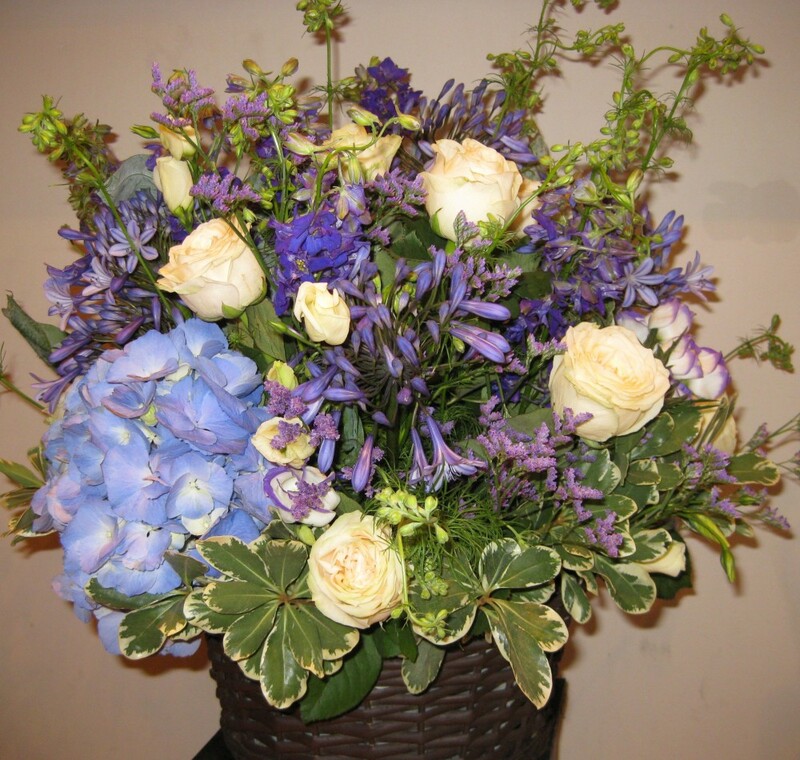 Our Rachel is very fond of mixed summer blues and lilacs, especially as they are popular with bees and butterflies so we created this arrangement with her in mind. Featuring the ever popular large headed blue Hydrangeas with starry flowered Agapanthus, the long spires of Larkspur and a little lilac Limonium to lighten and soften the effect. The foliage is pittosporum which has a cream variegation on the leaf edge, this picks up perfectly the creamy vanilla tones of the Roses. This is a large country house style of arrangement suitable as a Housewarming or Thank You gift, but could also be a particularly gorgeous gift to welcome a new baby Boy. A similar mixture would work well as a hand-tied bouquet, you only need to ask or put it in the special request box! The arrangement shown is the deluxe version in a dark wicker basket. Occasionally we are unable to source a dark wicker basket so substitute with one of equal size and value in charcoal or whitewashed wicker. One of our ECO friendly range the basket can be recycled or upcycled. Why not ask about our deposit scheme for recycling vases, baskets and containers?